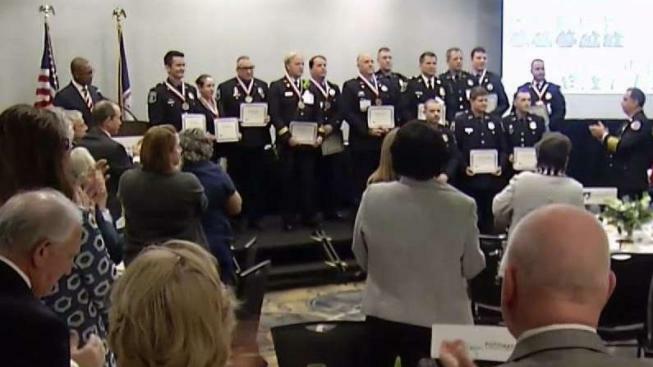 The officers and medics who first responded to last summer's shooting at the Republican congressional baseball practice were honored for their bravery at a ceremony in Alexandria, Virginia, Thursday. One by one their names were called to receive their medals for valor to a standing ovation, but that wasn’t on their minds 10 years ago. "They're glad to be here with their families, they'll take their moment in the sunshine, but they'd rather be out there on the road," Alexandria Police Chief Michael Brown said. The morning of June 14, shots were fired at Simpson Field in Alexandria, where members of the Republican team were practicing. Officer Kevin Jobe arrived first, followed by Officer Alexander Jensen, who took cover behind his own vehicle, and Officer Nicole Battaglia, who approached the parking lot, took on fire and reported her location. Alexandria and Capitol police took down the shooter and secured the area. The guman, James T. Hodgkinson, was shot and killed by police. The wounded included House Majority Whip Rep. Steven Scalise; Matt Mika, a lobbyist for Tysons Foods; Capitol Police Special Agent Crystal Griner; and Zack Barth, an aide to Rep. Roger Williams (R-Texas). Scalise and Mika were seriously injured. Several other first responder also were recognized Thursday for their life-saving actions that followed. "It was a high-profile event, but I must say they went above and beyond in my book," Brown said. But compliments don’t settle well with the officers and medics recognized with the medals, who say they were just doing their job of keeping Alexandria safe.